Production process manager for Node.js / io.js applications. Perfectly fitted for microservices architecture. 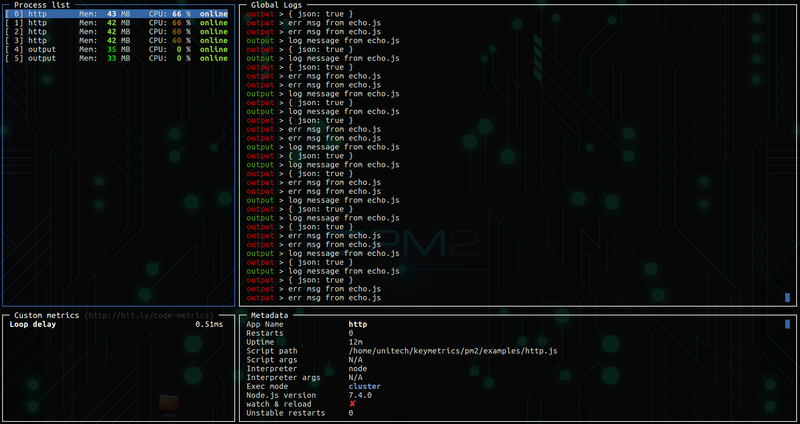 PM2 is a production process manager for Node.js / io.js applications with a built-in load balancer. It allows you to keep applications alive forever, to reload them without downtime and to facilitate common system admin tasks. PM2 is constantly assailed by more than 700 tests. Compatible with io.js and Node.js. Compatible with CoffeeScript. Works on Linux (stable) & MacOSx (stable) & Windows (bêta). Your app is now put in background, monitored and kept alive forever. When an app is started with the -i option, the cluster mode is enabled. Warning: If you want to use the embedded load balancer (cluster mode), we recommend the use of node#0.12.0+, node#0.11.16+ or io.js#1.0.2+. We do not support node#0.10. *'s cluster module anymore. With the cluster mode, PM2 enables load balancing between multiple application to use all CPUs available in a server. Each HTTP/TCP/UDP request will be forwarded to one specific process at a time. $ pm2 logs --timestamp "HH:mm:ss"
PM2 can generate and configure a startup script to keep PM2 and your processes alive at every server restart. Execute the startup command only as the user to be running the PM2 daemon. PM2 comes with a development tool that allow you to start an application and restart it on file change. Thanks in advance and we hope that you like PM2! PM2 is made available under the terms of the GNU Affero General Public License 3.0 (AGPL 3.0). For other license contact us.